Galloway Forest Park , at over 300 square miles, is one of the UK’s largest forests. It includes south west Scotland’s tallest peak, the Merrick; the UK’s first Dark Skies Park; the 7Stanes mountain bike trails; 3 visitor centres and 27 way marked trails. A forest this large also has many different facets and ‘woods within woods’, as well as a rich natural and cultural history. 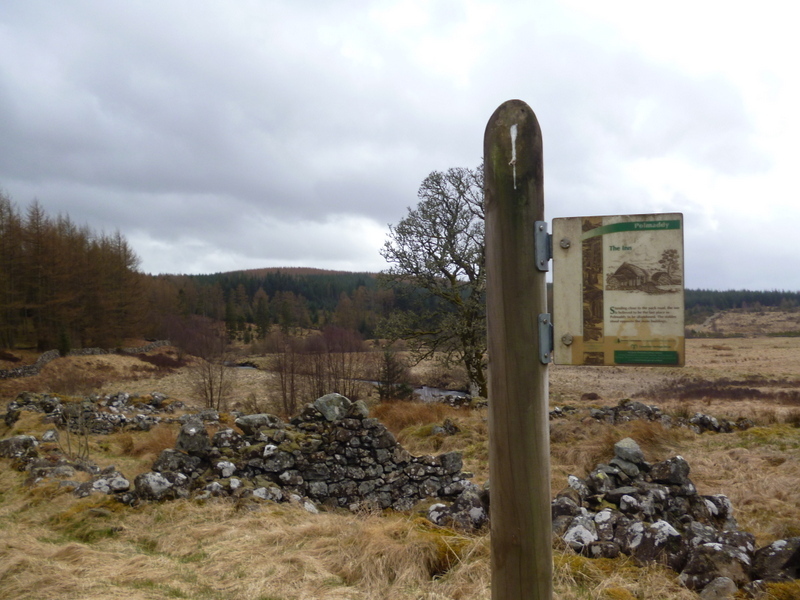 Polmaddy is the ruins of a classical Galloway ‘ferm toun’, nestling in the heart of the Galloway Forest. This farming community was founded sometime before the 16th century, it’s thought, but the ‘improvements’ and the lowland clearances of the 1700s and 1800s resulted in Polmaddy finally becoming abandoned, but the ruins of its inn, houses, water mill and stables can be seen on a 1km way marked route. It’s a magical place and there’s an almost palpable sense of history. It’s thought that Robert the Bruce hid here during the wars of Independence against the English, and as a reward he gave the miller ownership of the mill. There’s more information, including photos and details of how to get there on the Visitwoods web site. The remains of the Inn at Polmaddy, thought to have been the last building to be abandoned at Polmaddy. But for anyone with a limited amount of time and wanting to experience this amazing forest from the comfort of a car, then a drive down the 17 mile Queens Way, the A712 which connects New Galloway with Newton Stewart, is not to be missed. This road crosses through the heart of the forest. There are lots of laybys where you can park and easily visit attractions such as the Grey Mare’s Tail waterfall, the Wild Goat Park, Bruce’s Stone and Clatteringshaws Loch. There is also the Glen of the Bar – not for the faint hearted! 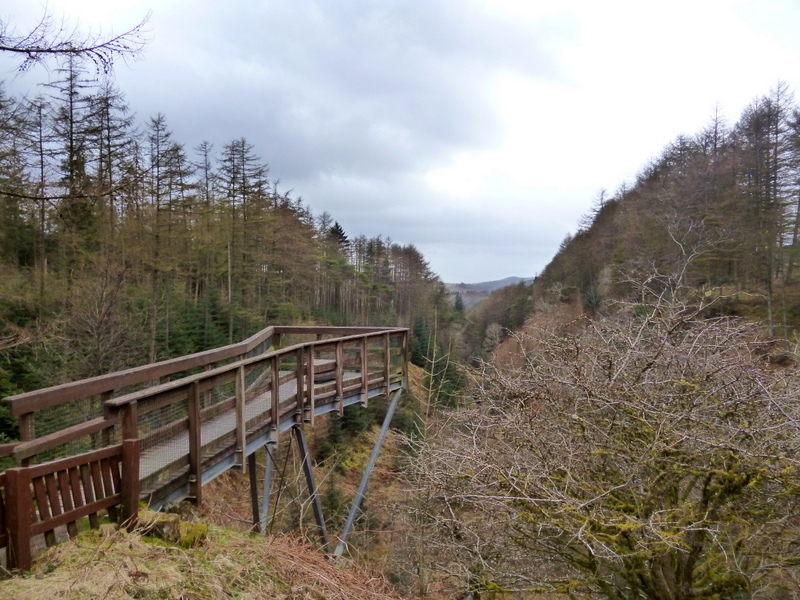 – a viewing platform which overhangs a steep sided wooded valley where, it is thought, ancient Gallovidians drove wild animals over the edge prior to butchering them for meat and hides. There’s free parking here, and a picnic table too so you can have a mini adventure and a fight with the chaffinches over your cheese sandwiches and all within site of your parked car! The viewing platform at the Glen of the Bar on the Queens Way. But the very best way of exploring this huge forest really has to be in foot or on your bike! Get more information on the Forestry Commission Scotland web site.